At some point during the summer vacation, the Oriental Institute Library will need to close temporarily. This is to allow for refurbishment work funded by the recent gift to the University, given in honour of the British Foundation for the Study of Azerbaijan and the Caucasus, which was announced in the University Gazette of 25th Oct 2018. Refurbishment will include creation of a room within the library to provide office accommodation for Nizami Ganjavi scholars. This will involve some substantial building work that will include creation of a new door from the scholars’ room into the main Oriental Institute lobby area. The current library reader service point will be moved to a new location in the library; the acoustic barriers surrounding the service desk will be removed and new acoustic barriers will be installed around the relocated service point. The closure dates and advance notice of periods of noise and disruption to users will be communicated as soon as the library receives a detailed schedule of work. We would ask those who are planning to work in the library over the summer vacation to get in touch with library staff to let us know as soon as possible when you are planning to work in the library and what open shelf books you are intending to use. The graduate student vacation loan limit will be raised to 20 books and we strongly advise people to borrow their books at the beginning of the vacation. A fetching service to the Sackler Library will also be put in place. If you know of any colleagues from outside of Oxford who are planning to use the Oriental Institute Library over the summer, we would be grateful if you could share this advance warning with them. This entry was posted in Building Works, News, Re-organising the Library on 22 March 2019 by katieguest. We are now issuing books on Vacation Loans, so they will be due back on Tuesday April 30th. We will remain on our term-time opening hours of 9am-7pm next week (March 11th-16th) and thereafter will be open from 9am-5pm during the week and closed on Saturdays. We will be closed for Easter for the usual five days: Thursday 18th – Monday 22nd April inclusive. We have yet to finalise the opening hours for the week beginning 22nd April, but will post an update on the Facebook page when we know. This is to a certain extent dependent on staff leave and the availability of cover. As ever, please keep an eye on the Facebook page for any updates or last-minute changes to our opening hours, and have a great Easter Vacation! This entry was posted in Uncategorized on 8 March 2019 by katieguest. We daresay that all our readers had a pleasant holiday and have now got back into the swing of Term. As we write this on a very snowy Friday afternoon it is pleasing to see that many of our regulars have not been put off by the weather! On a more serious note, however, we ask that readers, if they do come in covered in snow, brush themselves off properly (preferably not in the foyer or the library) before handling the books. Last week we had a few which got covered in droplets of water from readers’ coats and gloves, and we’d rather the books stay as dry as possible, for obvious reasons! We will, of course endeavour to stay open during any further periods of winter weather, but please watch the Facebook page and other outlets for any updates. As you’ll have seen on the Facebook page, the Bodleian Libraries’ reader survey is being run again this year: www.bodleian.ox.ac.uk/reader-survey. We urge everyone who uses the library to please respond; it is a valuable tool for us in gauging reader satisfaction and identifying areas which we need to work on or to improve. The survey runs until 17th February, so you still have a couple of weeks to fill it in! The Week itself is from 4th-8th March: http://openaccess.ox.ac.uk/home-2/open-access-oxford-week-march-2019/ please see the website for details of related events throughout the week. That’s all for this month! As ever, please see the Facebook page for updates on more immediate matters such as SOLO, deliveries etc. This entry was posted in News, Services on 1 February 2019 by katieguest. We’re sorry that this blog post has been somewhat delayed this month; this was mostly due to there not really being a great deal of news, but illness was also a factor as there has been a nasty cold going round. We hope not too many of our readers have been affected! One thing we had been meaning to mention, out of general interest to our readership, was the exhibition about T.E. Lawrence which has been on since October; please see the website for more information: http://www.magd.ox.ac.uk/libraries-and-archives/news/new-exhibition-lawrence-of-oxford/. We are very pleased to report that, thanks to the sterling efforts of our extra members of staff this term, we have managed to clear the shelving backlog in the Korean Studies Library section in the basement. Thanks in particular to Ben, who has done a great job of sorting this out. Hopefully, now that the shelves are better arranged, we will not find ourselves with the same space problems in the future! The Oriental Institute Library will be open until 7pm next week (3rd-7th December) and 11-5pm on Saturday 8th; after which we will revert to our vacation hours of 9-5pm (closed Saturdays) until the 6th of January. Vacation Loans are now in effect; all books checked out or renewed will be due back on the 15th January (Tuesday of 1st week). The Oriental Institute building closes for Christmas at 5pm on Thursday 20th December, so we will be closed on the Friday 21st, unlike most of the other Bodleian Libraries. We will re-open on Thursday 3rd January at 9am. We are aware that some readers have cards which expire on the 31st December and who will therefore not be able to borrow or renew their books beyond that date. We are happy to waive fines for readers in this position once they have renewed their cards as it is not their fault that their card expires during the closed period. Do let us know if you need any help with this. Finally, we would like to wish our readers a good holiday, and a happy Christmas to those who celebrate it! This entry was posted in News, Opening Hours, Vacations on 30 November 2018 by katieguest. October is upon us once again (where did September go?!) and we find ourselves at the start of another Academic Year. We are excited to meet all the new students and of course to see all our returning readers again. What follows is a brief news-report of the summer, and a few reminders of the library rules and general housekeeping so that we can get off to a smooth start. The summer saw the continuation of the building works to change the heating system in the Oriental Institute, and also the installation of new windows on the basement. We were closed for four weeks, during which time our Sackler colleagues facilitated collecting of books from OIL to their reading rooms for our readers (thanks again to them for that!). Unfortunately, a supply problem resulted in the closure not coinciding with the noisiest part of the work, which happened when the shiny new pipes were being installed and caused some disruption. Happily the installation is now complete and the new panels near the ceiling are ready. The new heating system should be much more efficient and less wasteful than the previous (largely uncontrollable) one, so we should not need to have *quite* so many windows open in the middle of winter. Kate has collated her reclassification data for the 2017-18 academic year; she has reached the last tier of the row which she started last year and has reclassified 645 shelfmarks, amounting to 797 individual books, in the last year. A minor book-move was carried out over the Vacation. This mostly affects the end of the LC sequence, where the main change is that the PK books now start in the middle section rather than under the windows by the computers. PJ now occupies that space, with space to grow as that is the area currently being reclassified. All the shelves are labelled as accurately as possible (allowing for occasional moves round corners). There are now only two large sections which have similar shelfmarks to the LC collection – PJ and PK. We have noticed a difference over the past few years in the numbers of people asking where things are, which has reduced dramatically as the reclassification has progressed, so we know it is worth doing! If at any time you need a book which is being reclassified, please speak to staff. If it is not a Tuesday or Friday afternoon (the days when Kate is at OIL) then it might be awaiting a label on her trolley, but staff will be able to advise you. Excitingly, we have three new members of staff joining the OIL team this term. Ben, who is the Graduate Trainee for the Sackler, will be doing some hours at OIL this year including Tuesday evenings; Katie, who is the Graduate Trainee at the Taylorian, will be working Thursday evenings during the Terms this year, and Jennifer, a new Library Assistant with responsibilities for both Sackler and OIL will be spending some of her time at OIL each week. We are optimistic that these extra pairs of hands will enable us to deal with problems which have arisen due to our staffing-shortages over the last few years, including the shelving in the basement, which requires a re-organisation of the KSL section for which we have had no time. As it is now Term time, we are now open until 7pm on weekdays and from 11am – 5pm on Saturdays. Up to 8 books can be borrowed at any one time, the normal loan period is 2 weeks, and they can be renewed online via SOLO up to three times before you need to bring them back to the library. We have longer loan periods during vacations. If you are not able to renew an item it is likely to be because someone else has placed a hold on it; if this is the case, please return the book to the library by its expiry date. Please leave books for return in the big blue box on the counter just inside the library door or pass them to the library staff member at the desk. Please do not leave returns anywhere else, especially the returns trolleys inside the library, as this may result in them not being checked in properly. If this happens they may stay on your record for longer than necessary, and you could get emails suggesting that they are overdue. If you have been using a book in the library and are not sure where it came from on the shelves please leave it on the shelving trolleys by the front office or on one of the reshelving areas in the library, rather than putting it back in a random gap. This is especially important for the complex Library of Congress shelfmarks as mis-shelving even a few books away may mean that people cannot then find the book again. If you are not sure, please leave it for us to do. It’s what we’re here for, after all! As a general rule, books from the BSF cannot be borrowed from the library. Please do not attempt to take them out of the building. They belong to the Bodleian, which has a no-borrowing policy. BSF books can be collected from the library desk – just show us your Bod Card so we can collect it from the back office – and should be returned to the desk after each use so we can put them back in the reserve. BSF books will stay here for one week, and this can be extended using your SOLO account. There are two exceptions to the no-borrowing rule: the Aris Collection of Tibetan Books or the Arabic Literature collection which originated at the Middle East Centre. These books may be borrowed in the normal way. Please do not send books back until you are sure you’ve finished with them completely as they will take up to a week to return if you re-order them. If a book is left on the desk we will usually return it to the reserve rather than sending it back to the BSF for this reason. Food and drinks other than water are not permitted in the library because they can encourage pests which damage the collections. If you need to eat something, please use the Common Room in the basement. Water in a bottle with a lid which can be sealed is permitted in the library, but please do not use plastic cups. Keep-cups are not allowed. PCs for the use of readers are located to the right as you enter the library; four are Library PCs which require a login and the other two are “kiosk” PCs which connect to the internet but have limited functionality for other things. There is also another PC in the basement which is available for readers to use; it is at the far end from the staircase, next to the microfilm reader. 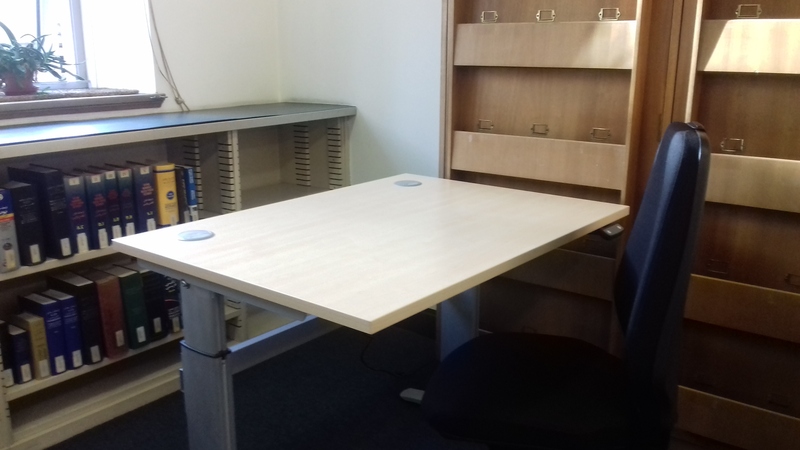 We have a height-adjustable desk, located near the windows by the library computers which is available for anyone who needs to work in a standing position; there is also an adjustable chair which can be used either with the desk or at a normal desk. If you have any suggestions of books which we should hold but do not, there is a form which can be accessed via SOLO, or you could write something in the Suggestions Book, which is on the counter in the aisle directly opposite the door to the back office, near the photocopiers. We monitor this regularly and are happy to acquire (within budgetary reason) books relevant to the collections. Finally, if you have any questions, please ask! There will be someone at the desk or shelving nearby most of the time; look out for a note on the front counter. This entry was posted in Building Works, Library of Congress Collection, Loans, News, Opening Hours, People, Re-organising the Library on 9 October 2018 by katieguest. We have yet to receive a timetable from the builders for the remainder of the building work still to be done, some of which will be carried out in the library. They have now started on some of that work as of this week, however. If any areas of the library need to be sheeted off to protect them during the works we will ensure that staff can get into those areas at least once a day to retrieve books which readers may need; we will endeavour to keep everyone up to date so keep an eye out for notices around the library. Kate has been moving the Library of Congress section around again, we’re afraid. PK now starts in the middle of the library near the Reference section at the Sackler end, the PJ sequence having been extended into the shelves under the windows. This should facilitate her continuation of the reclassification project, which is gradually moving towards its completion. Shelf labels in the affected areas will be updated before the start of Term. A reminder that we are CLOSED on the August Bank Holiday Monday, August 27th, and also on the Monday and Tuesday of the following week – September 3rd and 4th for St Giles Fair. Otherwise our opening hours will remain 9am – 5pm Monday to Friday until the start of Term. This entry was posted in Building Works, Library of Congress Collection, Loans, News, Opening Hours, Re-organising the Library on 21 August 2018 by katieguest. Readers will now be aware our four week closure for the planned heating works begins THIS FRIDAY, 13th July, after which we will not re-open until August 12th. We have made arrangements with our colleagues from the Sackler Library, who will be able to fetch books from OIL for readers to consult at the Sackler Library during the closure. Please email them on sac-loans@bodleian.ox.ac.uk if there is anything you wish to see during the closed period. Note, please that the books will be made available in the Sackler Library for consultation only; they will not be borrowable. If anyone is aware of potential visitors to the OIL during the period 16th July – 12th August please do make sure you let them know about the limited availability of the books and pass on the other contact information. Most of the OIL staff will be on leave for much of the time during the closed period so the oilcirc@bodleian.ox.ac.uk address will not be closely monitored. Unfortunately, due to a supply problem, the contractors have very recently informed us that they may not be able to finish all the work before we re-open. They have agreed to try to do the most disruptive work out of opening hours after the 12th August so that there is as little disruption as possible to readers, but there may necessarily need to be some areas which are screened-off for drilling or other disruptions. At present we do not know any details; we will keep readers informed after we re-open as soon as we have more information and will give as much notice as possible if there are likely to be inaccessible areas of the collection or other problems. Vacation Loans are now in effect until 16th October 2018; readers are permitted to borrow up to 15 books – an increase from the usual 8 – during the summer. During the weeks on either side of the closed period the library has reverted to vacation opening hours, 0900-1700 on Monday-Friday and closed on Saturdays. We will also be closed as usual over the August Bank Holiday (25th to 27th August inclusive) and for the two days of St Giles Fair, which falls on 3rd-4th September this year. This will be our last post until the end of the summer (since there’s not really going to be any news). We wish all our readers an excellent summer and hope your studies aren’t too badly disrupted by our absence. We look forward (even in this scorching weather) to a winter where we will finally be able to control the heating! This entry was posted in Uncategorized on 10 July 2018 by katieguest. We decided to delay the blog post for a couple of weeks after the start of April as we figured that it was better to wait until a time when most people are actually back in Oxford, rather than right at the start of the month when we were all sluggish from too many Easter eggs. Ahem. We trust you all had a restful break? We took delivery over the vacation of these new pieces of equipment, a height-adjustable table and a chair which can be configured for various positions for use with the table or elsewhere. 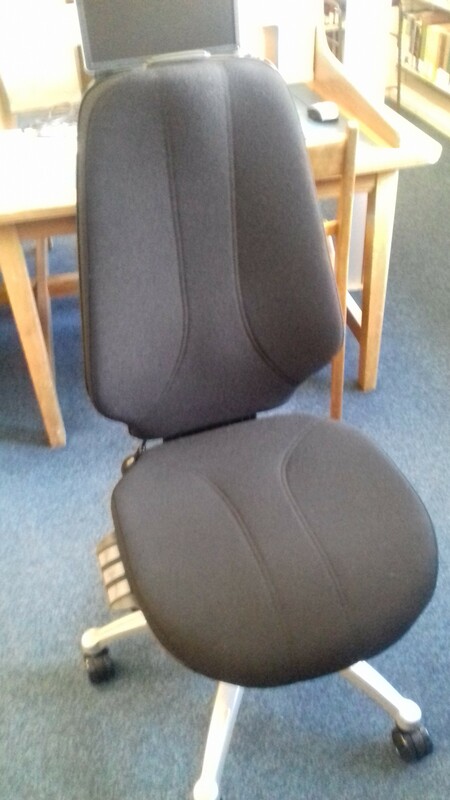 Anyone is welcome to make use of them, but please note that readers with a specific need – such as the need to work at a high desk due to a back problem, for example – will take priority. Readers of Persian may be interested in the above event on May 16th. Bookings may be made through the website. We will mention this again on Facebook nearer the time to remind everyone. Last week we said goodbye to Natalija, who has left OIL to work as a cataloguer for the Bodleian, based at the Osney offices. We would like to wish her the best of luck in her new job – she will be missed by the rest of the team. The PJ section has been rearranged again over the vacation to make room for the end of the 6000s, which were rather too crowded. We hope this will facilitate the reclassification for some time, although these things are notoriously hard to predict. Finally, a reminder that we are now back to our Term time opening hours, so will be open from 9 am to 7 pm on weekdays and 11 am to 5 pm on Saturdays. This entry was posted in Library of Congress Collection, News, People, Re-organising the Library, Services on 17 April 2018 by katieguest. This post is a little late, owing to the slightly chaotic scenes last week when we were a bit short staffed due to the extreme weather conditions. We would like to thank everyone for your patience with the delays to the deliveries which resulted from the snow, and also apologise for the tropical conditions in the library. The old heating system got rather enthusiastic when the temperatures outside dropped, and we know that some people found the resulting heat a little too much, particularly as everyone was dressed for the Siberian conditions outside. Fortunately, the observant will have noticed the additions around the building of new radiators which will be plumbed in during the Summer vacation and will enable us to control the temperatures around the library and hopefully keep readers (and books) in slightly more favourable conditions. With this being the final week of Term, please note that we will revert to vacation opening hours from 19th March until 14th April: we will be CLOSED on Saturdays and will be open 9am – 5pm Monday-Friday. We will also be closed for Easter from Thursday 29th March until Monday 2nd April inclusive, reopening at 9am on Tuesday 3rd. Vacation Loans are now in effect; any books checked out or renewed will be due back on April 24th. As we mentioned in February’s post, we are currently at something of an impasse in the basement with regard to new Korean Studies Library books, for which we need to rearrange the shelves. We have not managed to organise this due to staffing pressures, but hope to reach a solution soon. In the meantime readers are welcome to browse the reshelving trolleys on the ground floor if there are any basement books which they cannot find on the shelves downstairs. Kate has also reached a point with the PJ reclassification where she is unable to fit anything else on the shelves and has been stashing unreclassifiable books on shelves near the older PJ sequence with a view to doing a book move after the end of Term. She will be adjusting the amount of growth space in the G-P sections in the hope of making up a bit of room to space out the PJ section where it is particularly full and also to fit in the books which have not been reclassified. She tells us that the problem lay in the large number of dictionaries, which took up a lot of shelf space and left her without much flexibility for additional books in the same area. She will begin moving things next week, and apologises in advance for any falling book noises or bad language. Incidentally, all the Hans Wehr Dictionary of Modern Written Arabic editions are now on the shelf by the front office as far as we know, but if anyone sees any with the old label please feel free to pass them on to Kate to be reclassified! This entry was posted in Loans, Opening Hours, Re-organising the Library, Vacations on 6 March 2018 by katieguest.